There's no doubt that the Samsung Galaxy S10 and the Samsung Galaxy Note 10 are going to be two of the biggest smartphone launches of 2019 – and with the launch of the S10 phones almost upon us, you might be wondering which handset is the best choice for you. Should you fork out your hard-earned cash now on the Galaxy S10 or keep your wallet closed until the Galaxy Note 10 arrives later in the year (probably around August time)? Here's how the best Samsung phones of 2019 stack up, based on the leaks and rumours. As we mentioned at the start, Samsung has a date in the diary for the launch of the Galaxy S10 and the Galaxy S10 Plus: namely Wednesday the 20th of February. As is usually the case for Samsung, it's going to be the S phones leading the charge for 2019, with more mid-rangers and the Note following later in the year. But how much later? There's no official event scheduled yet, but considering the Galaxy Note 9 launched back in August 2018, it seems a fairly safe bet that the Galaxy Note 10 is going to turn up in August 2019. Samsung likes to keep to the same sort of schedule each year, and that would leave a decent gap between the launches of the two flagships. When it comes to pricing, last year the starting prices for these two phones were £739 or $720 for the Galaxy S9 and £899 or $1,000 for the Note 9, a markup of a little over 20 percent. You can expect the gap to be the same sort of size again this year – with the Note having a bigger screen and a stylus – but the actual starting prices might be a little higher than we saw in 2018. Based on the leaks we've seen so far, the Galaxy S10 and Galaxy S10 Plus are going to come rocking a punch hole cut out for the front-facing camera rather than an iPhone-style notch. Apparently the S10 will have a 6.2-inch display, the S10 Plus will have a 6.44-inch display, and there might even be other variants this time around. What's more, the fingerprint sensor is tipped to be under the screen rather than around the back. As for the Galaxy Note 10, on the whole we're thinking it's going to end up looking a lot like the Galaxy S10, and the leaks we've seen so far bear that out. Apparently the screen size is going to hit a rather massive 6.66 inches, corner to corner, but exactly what type of front-facing camera cut out we'll get remains to be seen. Again, it's likely that the fingerprint sensor will be sitting under the front display. There's only so much that phone makers can do now with their slabs of glass and metal, and we're not expecting too many dramatic changes for these phones in terms of design – and they should end up looking very similar, albeit at different sizes. Thin bezels, small cut out notches, and in-display fingerprint sensors are going to be the order of the day. The situation is a little clearer when it comes to internal specs. We know the Galaxy S10 phones are almost certainly going to be powered by the Samsung Exynos 9820 chip or the Qualcomm Snapdragon 855 chip, both new for this year. Which one you get is going to depend on the part of the world you live in. If Samsung follows the same pattern it's used in previous years, the Galaxy Note 10 will use the same internal processors as the Galaxy S10 phones. There have been some rumours that this year will be different, if Samsung can get the Exynos 9825 chip ready for the second half of the year, but for the most part it's likely that there won't be much to choose between these phones in terms of raw power. Last year the Note 9 offered more storage space and more RAM than the Galaxy S9, and that could well be the case in 2019 as well. 6GB looks set to be the minimum for the standard Galaxy S9 and S9 Plus models, while the Note 10 could start at 8GB and go even higher than that. The Note 10 will certainly be the most powerful phone, but it's unlikely we'll see a huge difference. What else can we expect from these handsets? Both the Galaxy S10 phones and the Note 10 are being strongly tipped to come with 5G capabilities out of the box, even if the super-fast networking infrastructure has yet to make it to your neighbourhood. All the features we've come to expect, like wireless charging and waterproofing, should be included as well. 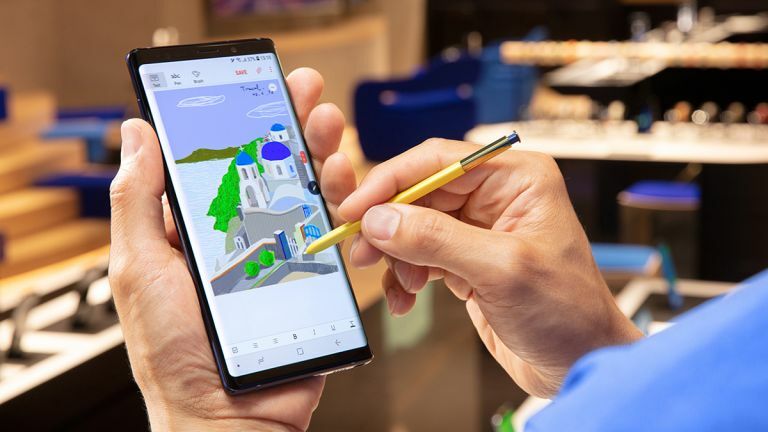 The Note 10 will of course come with its signature stylus for doodling on the screen or controlling media playback, and when it comes to cameras we're expecting upgrades across the board from last year: perhaps a dual-lens snapper on the back of the S10, a triple-lens camera on the back of the S10 Plus, and a triple-lens camera again on the back of the Note 10. A better camera is one reason you might want to hang fire for the Note 10. It's clear that the Note 10 will be the better (and more expensive handset) – the question is by how much. We'd say if you've got the money and need an upgrade, the S10 or S10 Plus will do you very well indeed. The only real reasons to wait are if you want a bigger screen or a stylus, or you need a few more months of saving up.